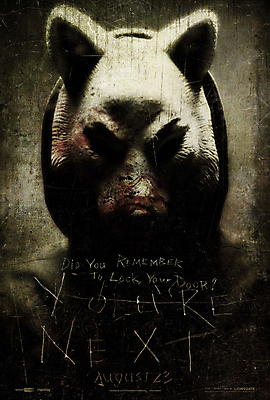 Lionsgate’s late-summer horror release, You’re Next, debuted over the weekend to $7 million (opening at number 6 on the box office chart) in spite of the film’s 80% fresh rating on Rotten Tomatoes. We loved it. As the aforementioned Tomato meter showed, most critics loved it, and the advance buzz – generated on nearly two years of festival hype while Lionsgate sorted out the logistics of the film’s release – was solid gold. One could spin things positively and consider it a “win” for the fact that an indie horror film – in this case directed by Adam Wingard and written by Simon Barrett – was given a theatrical release (on nearly 2,500 screens) at all. Still, You’re Next didn’t perform nearly as well as it should have in light of a fairly good summer season for horror (The Purge, The Conjuring), so what the hell happened? That was the question brought up a number of times to me during some gatherings during the weekend. We all want to see a great horror film do well for itself, but when it underperforms, you have to look at why. I’m not a box office analyst by any means, however, I’ve been at this long enough to see trends come and go and see films succeed and fail and the one thing I think many will agree with is: You can never, ever predict how a horror film will do. Ever. Granted, I suspected The Purge and The Conjuring would go over quite well – and they did. I figured You’re Next would find its audience, too. Needless to say, it didn’t and I’ve distilled a few reasons why I think that happened below. The Purge: It’s a film that does not remotely carry any similarities to You’re Next, however, I think it may have taken a bit of wind out of You’re Next‘s sails. To audiences, You’re Next is “another film about masked strangers terrorizing people” and they might think, “we already had one of these this summer, I don’t need to see another one.” It can be as simple and silly as that, sad to say. The Purge beat Lionsgate to the punch and sated the audience’s desire for entertainment of this ilk. When both films announced their respective release dates, I always thought Lionsgate should have made a last-minute change and positioned their film ahead of The Purge. It would have taken a crackerjack, swift marketing strategy, but it could have been done. Home Invasion Fatigue: While this sub-genre has mostly been exploited on the VOD and DVD market, audiences may be growing tired of seeing families being attacked in their home. Of course, my colleagues and fellow You’re Next fans know the film is more than meets the eye, but still, it’s about audience perception. They see it as a standard home invasion film. Advertising: And here is where that audience perception comes into play. Lionsgate knows how to market a horror film well. Their ads are ominous, classy, creepy and their trailers and TV spots pack a punch. But there are aspects to You’re Next that were not on display. For instance, in a conversation I had last night, two women expressed their disappointment that the ad campaign did not play up the “female empowerment” angle of You’re Next. Yeah…where was that? Further, where was a taste of the film’s humor? Granted, horror and comedy have a history of not playing well, but even just a small dose of You’re Next‘s humor may have given its potential audience something to latch onto. No Stars: Again, categorize under “sad but true,” but this matters. You’re Next had no one recognizable to shoulder an ad campaign on and lure in a crowd. It’s frustrating because, yes, we know the film may be great, but without a “star” some audience members may not be interested in spite of the fact that the cast of You’re Next deliver the goods. These are just a few theories. And they in no way reflect the film’s quality. Any horror fan worth his or her salt should be checking this one out in theaters. If you did go and support horror and see it, what did you think? Weigh in below!